I'm carrying out a project on Variable Pitch Propellers for UAVs and especially self-adjusting or Passive Variable Pitch Propellers that change pitch due to aerodynamic forces and Pitching Moments. At the moment I'm working on a single element (sectional airfoil) using blade element theory for three different stages of the aircraft: Take-off (with a given high RPM,e.g 2000), Cruise (medium RPM,e.g 1000) and landing (low RPM e.g 500) and corresponding free stream velocities 0 , 80, 20 m/s respectively. However while I'm trying to calculate first Lift and Drag and then Pitching Moments, I realized that there are unknown factors needed for the calculations such as lift and drag coefficients as well as Angle of Attack on that sectional blade element. The purpose is to use at first a symmetric aerofoil with no camber and I was wondering whether I have to use a commercial aerofoil such as NACA and if so, how to get the Cl and Cd from this aerofoil. How to calculate the angle of attack or pitch angle while I know their subtraction? Do I need to give some values for a new parameter that will help to find these calculations or RPM, Vinf, and r of the propeller is enough? What about the chord length; do I need to give a random value there? I am sorry if some of the questions are silly but I'm coming from a different background and I'm fresh in the aerodynamic field. There are a couple of key parameters in propeller design, the main ones being the power to drive the propeller, and the thrust that the propeller delivers. 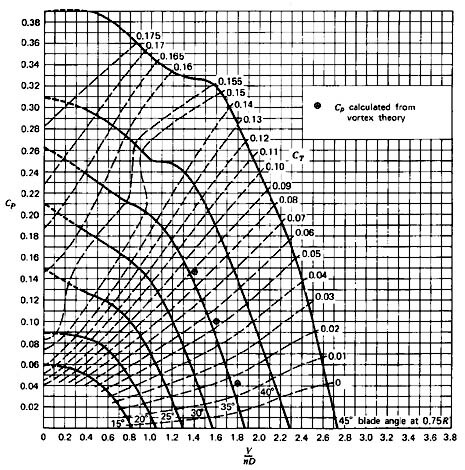 Induced velocity should be constant over the blade, implying that $\beta$ decreases linearly with increasing r: the propeller blade twist. Because the twist changes linearly, one point on the blade can be taken as the representative blade $\beta$, and this is usually taken at either 70% or 75% of the radial distance. We can now look up $C_P$ as function of J in for instance NACA reports from the NACA server (check NACA WR 286). Unfortunately these diagrams are not given in metric units, so would need to be converted. But there are many other sources, such as underneath from a question on this forum. Regarding the profiles: propeller design is pretty specialistic but old fashioned NACA profiles are still being used in helicopter blades for both main rotor and tail rotor. For a symmetrical profile NACA 0012 would be a representative choice, again available from the NASA report server, for instance NACA TN 4357. A google search on NACA 0012 data results in lots of hits. A reference book on this is Theory Of Wing Sections by Abbott & Von Doenhoff. For the chord length, you may want to have a look at existing propeller designs and their aspect ratio (propeller radius/avg chord). You could start with a value of 15 -20. There is quite some more info on propeller design for the pre-design phase that you are in, in Torenbeek's book referenced above, including on design for variable incidence props. Not the answer you're looking for? 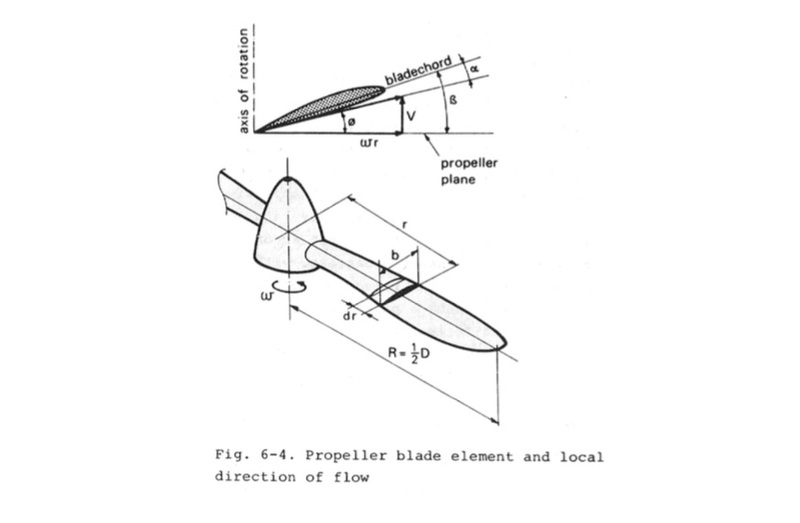 Browse other questions tagged aerodynamics propeller airfoil or ask your own question.